The shellOpener © is a lightweight device that opens the DNAshell® and RNAshell® minicapsules. The opening system has been developed to avoid any contact between the punch and the glass insert in the enclosed metal case. The shellOpener © ensures the distribution of minicapsules for all end users of DNA and RNA samples, giving them the ability to simply and quickly open them. 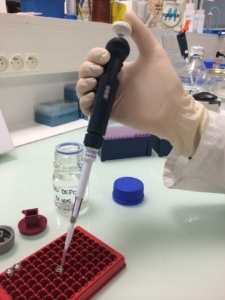 To retrieve the DNA or RNA samples from the minicapsules, place them on the capsule holder and then slide to the stop under the piercing tip. The 2D Datamatrix code must face down. 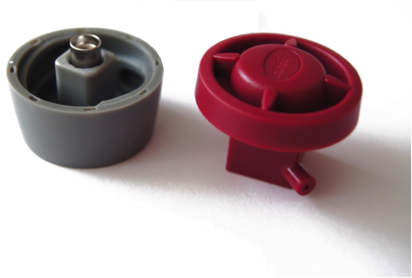 Cover the fixed part of the shellOpener © with the red lid containing the punch on the top of the capsule. While holding the gray base, turn the cover clockwise until it stops. To recover the minicapsule, disassemble the lid of the base and remove the now open capsule. When opening, the insert remains attached to the case, traceability is maintained. Dried DNA and RNA samples are recovered simply by adding water or buffer; resuspension is virtually instantaneous. The device consists of a thermoplastic body and a stainless steel punch. It has a red lid holding the punch and a gray base to hold the capsule. The device measures 3.8 cm in diameter and weighs 21 grams. The shellOpener © is able to open up to 30 minicapsules.